• A brilliant combination of mind-blowing magic and gut-busting comedy. • Extensive use of audience participation; done without embarrassment to anyone. • Very simple technical requirements. • Rated the number one Comedy Magician in the world. Acclaimed by MAGIC Magazine as the premiere comedy magician in the world today, Mac was just named “Magician of the Year” by the Magic Castle in Hollywood, just broke a Guinness World Record, just appeared on his seventh TV special for NBC-TV, just got voted the sixth best show in all of Las Vegas, just rocked the audience on The Late Show with David Letterman, tore it up on Penn & Teller’s Fool Us, and his book from Random House just entered it’s 12th printing. 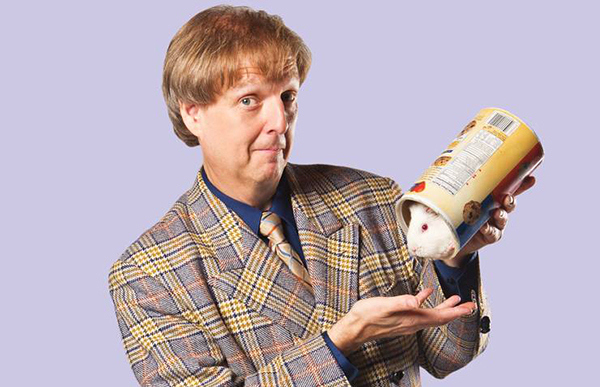 He’s been named “Entertainer of the Year” by Las Vegas Weekly, and “Best Magician,” “Best Bargain Show,” and “Favorite Male Las Vegan” by the Las Vegas Review Journal. Best Deal on The Strip….Looking like a dressed-up hayseed, but displaying an impish wit that belies his look. A ‘Best Bet’ for the weekend. Best Comedy Magician! That was GREAT!